The second edition of the Valletta Pageant of the Seas, a unique, large-scale spectacle providing entertainment for the whole family will be back on the 7th June at 5.30pm in the Grand Harbour as part of the Valletta 2018 Cultural Programme. This year’s edition of the Valletta Pageant of the Seas will include a number of competitive races, swimming challenges, a regatta, powerboat and sailing boat shows, audio-visual projections, music, fireworks and much more. The programme spans throughout the afternoon and evening of the public holiday, hosting fun sport activities by day, and colourful celebrations by night. One of the highlights of the day is the Grand Entry, an epic pageant during which the character of the Grandmaster will enter the Grand Harbour on the Fernandes, accompanied by a number of boats, disembarking at Pinto 5. Private boat owners are encouraged to take part in this pageant. After the Grand Entry, private boat owners will have the opportunity to anchor their boats in a designated area in the harbour, from where they can enjoy the rest of the show. Other activities include Għawma Toni Bajada – a fun swimming challenge in which swimmers can register to swim from Fort St Angelo to Valletta – and Tellieqa Toni Bajada – a 2km long aquatic race in the form of a triangle, starting and finishing at the Barriera Wharf slipway. Around two hundred swimmers will be taking part in this race. Participants may also use their creativity to create their own rafts which they can race during Tellieqa Telliqun. The participating rafts may be created using various materials, however, they cannot include motors or oars. Regatta boats, pertaining to both Maltese regatta clubs as well as international guests, will race from the Old Customs House down to Ras Hanżir and back, while twelve Chaudron boats and twenty-eight sailing boats will also be entertaining those present with their respective choreographies in the Grand Harbour. Celebrations go on till the late evening. After sundown, the Grand Harbour will be animated with projections on a water curtain, a show by La Fura Dels Baus, as well as a large-scale pyrotechnic show for the grand finale, which includes aerial fireworks from various floats rigged in the water, as well as from Fort Ricasoli. “The Valletta Pageant of the Seas is the relationship between Valletta and the Sea which surrounds it, from the formation of the city, to the fact the throughout the ages, these same seas were Valletta’s entire being. This event will celebrate a number of Maltese characteristics in a site which we are very well known for the Grand Harbour,” said Parliamentary Secretary for Consumer Protection and Valletta 2018 Deo Debattista. This event is being organised by the Valletta 2018 Foundation, in collaboration with In Guardia Parade, the Malta Tourism Authority, Birkirkara St Joseph Sports Club, the Malta Rowing Association, Chaudron Powerboats, Surfside Charter Company Ltd, Mad About Video Ltd, La Fura Dels Baus, St Catherine’s V.M. Musical Society Żurrieq, St George’s Fireworks Factory and Independent Fireworks Factory Qrendi. 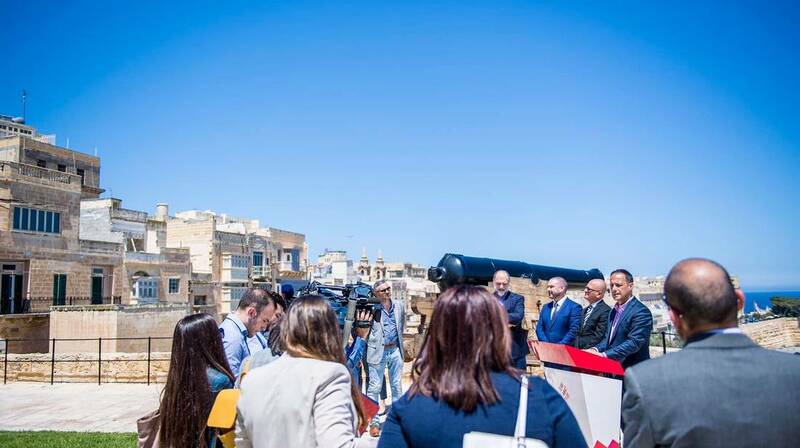 Supported by the Armed Forces of Malta, the Malta Police Force, the Civil Protection Department, Red Cross, the respective Valletta, Floriana, Senglea and Kalkara local councils, Arts Council Malta and Heritage Malta. For full programme of events and more information visit valletta2018.org. A 2km aquatic race, starting and finishing at the Barriera Wharf Slipway. Around two hundred trained swimmers will be participating in this triangle-shaped race. The Grandmaster, accompanied by In Guardia, enters the Grand Harbour on the Fernandes – which will be decorated for the occasion – accompanied by a group of privately owned boats. The Fernandes sails to Pinto 5, where the Grandmaster and In Guardia members disembark. Private boat owners are instructed to either leave the harbour or anchor their boats in the designated area in the harbour. Eight Maltese regatta boats and eight international ones race from Old Customs House to Ras Hanżir and back. A fun race around the harbour on hand-made rafts without the use of motors or rowing. All rafts are manufactured by participants from recycled material. A straight-line swim between Fort St Angelo and Barriera Wharf slipway. All swimmers will embark the Atlantis boat alongside the Old Fisheries and disembark by Fort St Angelo, where the race begins. The handing over of the Palju from the 2016 winners to the new 2018 winners. Includes band performances. Twenty-eight sailing boats, decorated with flags and fairy lights, enter the harbour from Kalkara yacht marina to perform a 20-minute choreography.